Arrow Rectangle Table 180cm Extending to 240cm x 120cm wide with 2 Grisdale Arm Chairs, 6 Grisdale Side Chairs and a 3m parasol. The set is delivered assembled to your door. This High Quality Teak Garden Furniture Set, when fully extended will seat 8-10 people comfortably. The table and chairs are of a fixed robust construction so they can be left outside all year round. 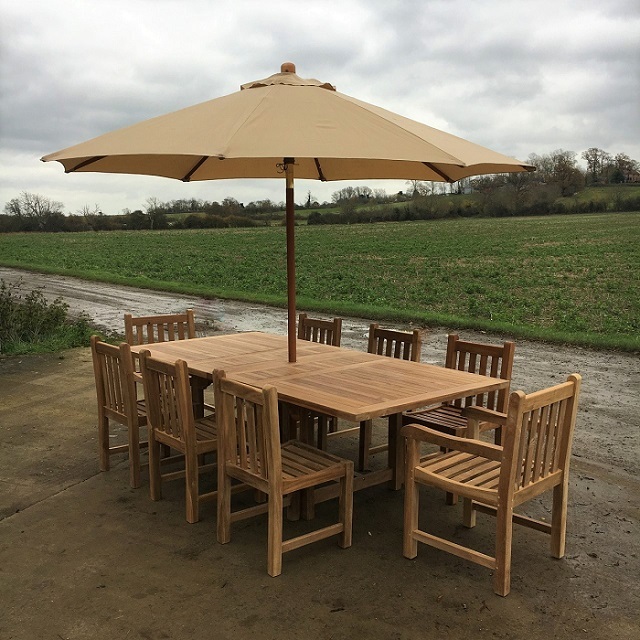 The Teak extending Table is constructed with a 40mm Thick top dovetailed & with mortice and tenon joints, and with a centre bar allowing the Parasol to be used whether the table is extended or in the closed position. All our Teak Garden Furniture Sets are manufactured from Certified Teak, Forest Law Enforcement, Governance and trade. (FLEGT), in accordance with EU Timber Regulations (EUTR) . 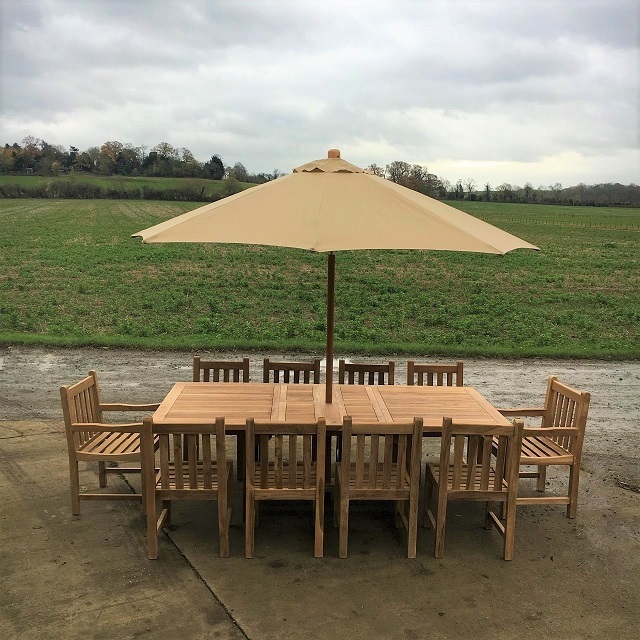 Arrow 120/180cm Extending rectangle table with 2 Grisdale Carvers & 6 Grisdale Side Chairs, 50cm Lazy Susan + 2.5m Parasol. Click the button below to add the Arrrow 180cm / 240cm Rectangle Chunky Table with 2 Grisdale Arm Chairs 6 Grisdale Side Chairs and a 3m Parasol to your wish list.